Eco-driving can cut up to 25% of your fuel bill. Let’s talk how? According to the investigated data, by adopting an eco-driving style, drivers can slash both their fuel bill and their emissions by as much as 25 % compared with ‘normal-average’ driving behavior. 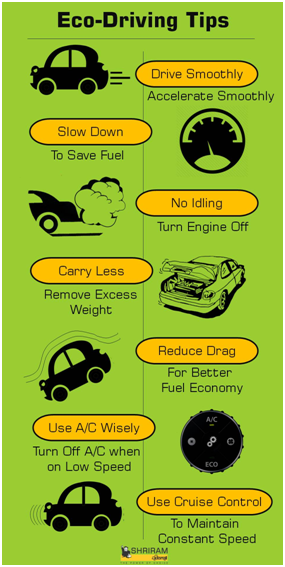 Fact is small changes to the way you drive can have a big impact on fuel economy. People go to extraordinary lengths to save money but then they jump in their cars and waste fuel. Through eco-driving they can avoid that. 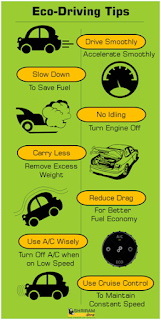 Poor driving habits can reduce fuel efficiency of your vehicle. As buyers purchase fuel efficient vehicles in large numbers to save cost and benefit the environment; however, few know that good driving habits are the best way to economize. Aggressive driving such as fast acceleration, speeding and braking can decrease your fuel mileage significantly. Therefore accelerate smoothly, brake softer and earlier, and stay in a single lane while it's safe to do so. Speeding consumes lots of fuel. By driving 90km/h instead of 100km/h, you can increase your fuel efficiency by up to 10-15 %. Also, try for a constant speed. Today's automotives don't need a warm up. Start the car quickly and gently to drive away. Don't leave your car idling. Extended idling will increase emissions and waste fuel. Reducing the amount of luggage you keep in your boot or back seat can increase your fuel efficiency as less energy is needed for acceleration. Your vehicle is designed for excellent aerodynamics. If you spend lots of time travelling on the highway or are planning a long trip, try to carry extra items inside the vehicle or attached to the rear. Also, by keeping your windows and sunroof closed can lower wind resistance. You will have less drag and better fuel economy. Your fuel economy decreases by up to 15 % when you utilize the air conditioner at low speeds. So if it isn't too hot, turn off the air conditioner when driving around town, and roll down your windows instead. However, at 90km/h or higher, using the air conditioner is favored compared to open windows. Initiating your cruise control keeps you from mindlessly driving faster thereby maintain a constant speed, and won't use additional fuel while accelerating. Try to set your cruise control at your vehicle's most fuel-efficient speed, as long as it's at or below the legal limit. Many short trips will use more fuel than a single, longer trip. So when you have to drive for chores, get as many completed as you can in one trip to increase your fuel economy. We hope this blog to be both knowledgeable and beneficial for you. If you want to acquire a used automotiveor equipment with better fuel efficiency, visit your nearby Shriram Automall. As company offers the best in class used vehicles and equipment of every make and model at optimal prices. Click the link below to register yourself or download SAMIL’s mobile App.